CIERA’s Alex Gurvich, a second-year astronomy graduate student advised by Professor Claude-André Faucher-Giguère, recently accepted two important fellowships within the same week. Part of the Galaxy Formation Group at Northwestern, Alex explores “the invisible universe” (the history and features of galaxies, stars, and supernovae) using computer simulations. Alex will receive three years of funding as one of 2,000 awardees of the National Science Foundation’s Graduate Research Fellowship Program. Chosen from over 13,000 applicants, the 2,000 individuals meet the NSF’s vision for both intellectual merit and “broader impacts,” meaning the potential value of their work to society. Alex explains that the heavy emphasis on broader impacts is a very gratifying part of the award for him. His outreach work at CIERA and the Adler Planetarium, sharing astronomy with the public through a variety of events and initiatives, is a fundamental part of his career. Alex will also receive a one-year graduate fellowship from Blue Waters National Center for Supercomputing Applications, which includes a significant allocation of time to use the powerful supercomputer hosted at the University of Illinois at Urbana-Champaign. Through their program, Blue Waters creates small cohorts of students each year from different disciplines. The students meet regularly via teleconference, work closely with the staff who manage the supercomputer, and present their work at symposia. 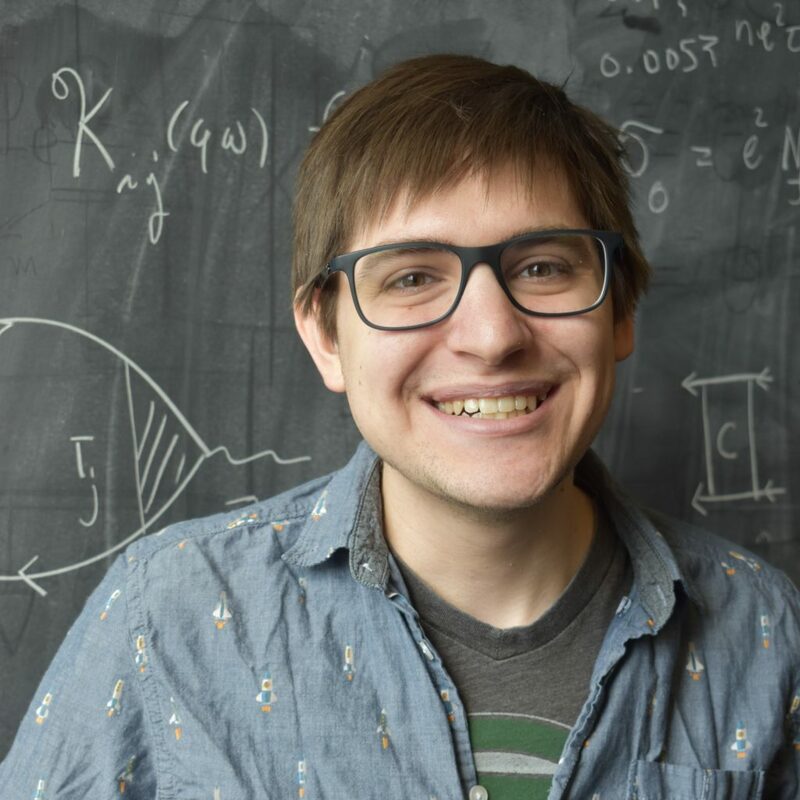 Alex will make good use of this crucial supercomputing resource: he is developing code that will speed up “CHIMES,” a galaxy simulation module built by another Galaxy Formation Group member, CIERA Lindheimer Fellow Alexander Richings. CHIMES is a chemistry module which helps astronomers make accurate predictions about the chemical compositions of galaxies and is very expensive to run. Alex’s goal is to use videogame graphics cards (which are great for scientific calculations!) to push CHIMES to do its simple but many calculations in less time. This would enable the use of CHIMES in simulations of galaxies that were too computationally expensive to run previously. He eventually plans to make the tool publicly available, allowing others to apply it to their own simulation codes. Graduate students commonly spend substantial time and effort each year writing proposals and applying to fellowships, in addition to working as teaching assistants, to support themselves. Alex is now in the extraordinary position of having the time and freedom to fully focus on his own interests and research for four consecutive years. He calls the two fellowships “career-enabling.” With an open schedule, he will be able to travel more often to collaborative meetings and conferences the world over, to present his work and to build his networks.